Winter is lousy for field work but it’s a good time to curl up with a book and learn something, so in that spirit I’ve decided to (finally!) 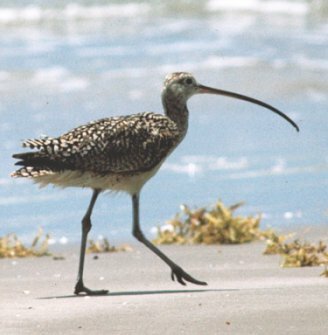 learn more about bird anatomy. Yes, I’ve watched birds for decades but that doesn’t mean I know the scientific names for the parts of a bird. During research on various blogs I’ve encountered many technical names, but what do they mean? Maybe the names stump you, too. Why not make this a group project? So here’s the first in a weekly series on bird anatomy. What is a culmen? It sounds vaguely like… ummmm…. “culminate,” a related word. 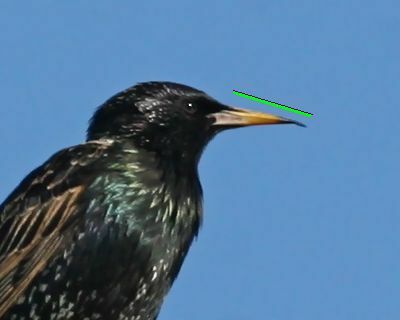 Answer: It’s “the dorsal ridge of the bird’s bill.” For us laypeople, it’s the top of the beak from the head to the tip, as shown by the green line. I encountered “culmen” when I looked for the length of the pileated woodpecker’s beak. The answer was “the male’s culmen is 43-56 mm” so I had to look up two things: the meaning of culmen and the conversion from millimeters to inches. The shape of the culmen is a useful field mark for identifying birds. 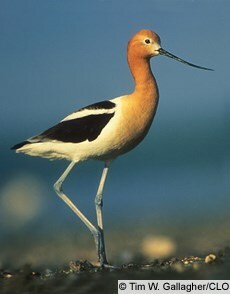 Some bills (culmen) curve up as on American avocets, some are straight, and some curve down as on the long-billed curlew. This is a wonderful idea. Thanks so much. Very helpful. I’ve long intended to do something similar but never managed. Thank you for taking this on! OK, Culmen. That’s good. And 24 mm to an inch So that’s about 2 inches of beak on a startling, beautiful bird.